Applying to a graduate-level business program often requires submitting scores from the Graduate Management Admissions Test (GMAT) as part of the application package. In some cases, an applicant may request that the GMAT requirement is waived for their application. Requesting a waiver of the GMAT is usually done by writing a GMAT waiver letter. The GMAT waiver letter is your request to the school asking that they excuse you from having to submit GMAT scores as part of your application. Many programs have rules in place regarding this type of waiver and will grant your request if certain requirements are met. The criteria for GMAT waiver eligibility is determined by individual institutions so may vary somewhat from program to program. To be exempted from submitting GMAT scores when applying to a program such as an MBA, GMAT waiver letters must convince admissions boards that your past academic and employment history demonstrates you already possess the skills and abilities the GMAT tests for, eliminating the need for submitting the scores. If you are applying for an MBA course, you should know you can ask the admission board for a waiver on your GMAT® score or its fee. But, what is the difference between a GMAT waiver and a GMAT fee waiver? Let us explain it to you. 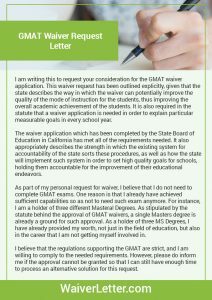 A GMAT waiver letter is a written request where you ask the college board to grant you a waiver on your GMAT® score. This can be because you do not want to take the test as you have professional experience that can prove your knowledge on the topic, or because you got a low score on your GMAT®. Whatever the reason may be, you are asking the admission board to not take into account your text. On the other hand, a GMAT fee waiver is a letter where you ask the school to let you take the test for free. In this case, you will have to include evidence of your economic situation and strong arguments as to why they should grant you that waiver. Bear in mind that even though both of them are written for different reasons, they should follow the same structure, language and include evidence. Introduction/First paragraph: Statement that you are requesting the GMAT application requirement be waived. Second paragraph: Reasons why you feel that the GMAT requirement should be waived. Provide the history of your professional work experience that demonstrates the use of the same skills as those measured by the GMAT. Show that your work performance indicates that you possess these skills at a level that will enable you to perform up to the standards of the program. When writing your GMAT waiver essay, you should pay extra attention to some points. Ensuring you follow a simple format is vital to make sure the reader can understand your letter and, therefore, understand your request. Also, make sure you briefly describe why you are asking for a waiver and include any relevant evidence to help you convince the reader. The language you use is another thing you need to be careful of. You are writing to ask for a waiver, so always use formal but catchy language – you should always treat the reader with respect. When writing your GMAT waiver letter, make sure you include all the relevant information and revise it once you have finished writing it. This will help you ensure you are sending a perfect letter. MIT Sloan Executive MBA. They take students with a GMAT waiver if they have a strong academic background and can show they have an ample quantitative background. University of Texas. This school can waive your GMAT® if you have substantial professional experience in the field. They ask candidates for 15 years of experience, at least, or to have an advanced degree. Temple University. If you have at least seven years of professional experience or a degree from an AACSB accredited university, they can waive your GMAT®. Saint Mary’s University of Minnesota. If you’ve got a low score on your GMAT®, you can apply for their MBA program. Notre Dame de Namur University. They also accept candidates for their MBA course with low GMAT® scores. 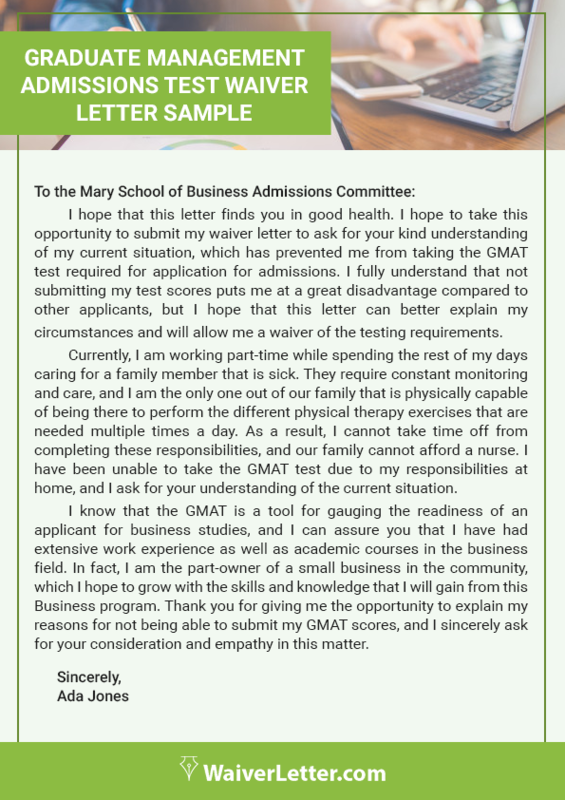 Write the GMAT waiver letter using a business letter format unless directed to do otherwise. If you are unsure how to write the GMAT waiver letter, our service can assist you. First, you should write a draft that includes all the main points you need to cover. Write short sentences on each paragraph to help you remember what you should include on each part. Second, describe why you are writing a waiver letter. This can be because you have a low score or because you have plenty of experience in the field. Either way, make sure you use persuasive arguments to explain it. Third, explain your professional experience briefly by writing about the key facts of your job. Alternatively, you can state the reasons why you got a low score on your GMAT®. This can be because of health, family or personal problems. In this case, you should attach a medical certificate or any other document that can help you prove your point. Fourth, remember to acknowledge the reader and thank them for their time. You should include this at the end of your letter. And the last step is to revise your letter. When writing it, you should always use formal language, you should treat the reader with respect – remember you making a petition. Once you have finished writing your letter, do not forget to proofread it and edit it if you think it can be improved. Ensuring you send a perfect waiver letter is key to getting your waiver accepted. Many years of experience. Our professional team has plenty of experience writing and editing waiver letter. Specialized in various fields. We count with writers that are specialized in different areas so we can help you write a waiver letter for any situation you may need it. We can offer writing and editing services. Thanks to our professional team, we can provide both, writing and editing service. Reliable professionals. We only work with trustworthy writers and editors to ensure you receive your letter on time. English language experts. Our writers and editors have excellent English writing skills and a great eye for detail. This helps us guarantee you will get a well-written and original waiver letter. 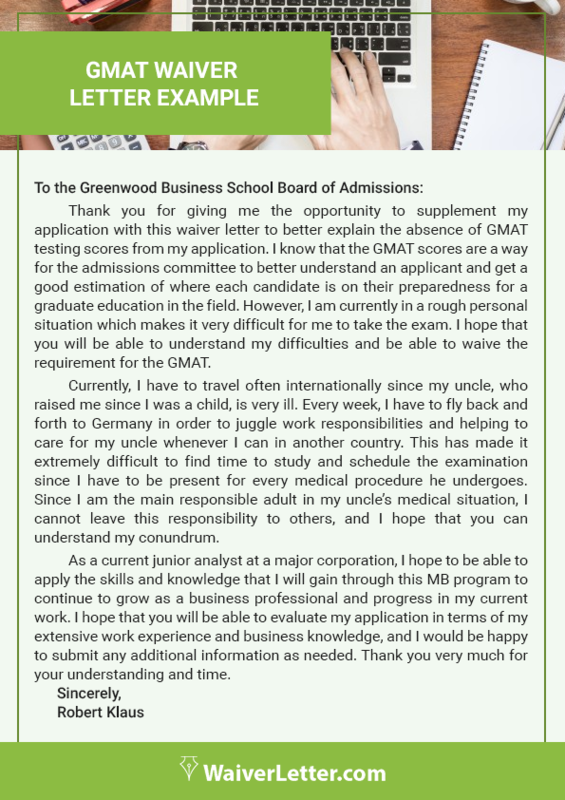 We specialize in English waiver letter writing for any purpose including GMAT waiver requests. The professional writers we use have advanced degrees and are well experienced working with GMAT waiver letters. For an effective GMAT waiver letter that gets results, contact us with your GMAT waiver letter requirements!